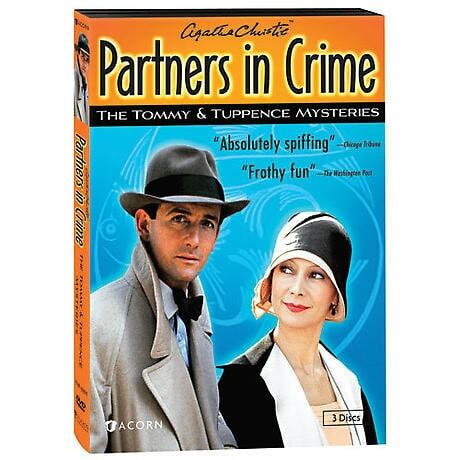 As proprietors of Blunt's Detective Agency, Tommy and Tuppence Beresford mix marriage and mystery-solving in Roaring '20s London. Packed with period atmosphere, playful banter, and fabulous clothes, this beloved British series is based on stories by Agatha Christie. Francesca Annis (Cranford, Reckless) and James Warwick (Lillie) are the flirtatious, fun-loving couple. Seen on Mystery! in the mid 1980s. 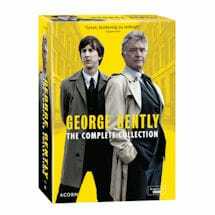 11 mysteries, 10½ hrs, 3 DVDs, SDH. Tommy Bereford and Tuppence Cowley meet again by chance in London just after the end of the first World War. Looking for work and longing for a bit of excitement, they stumble into the middle of the search for a secret document spirited off the sinking Lusitania. Bored by her comfortable but dull life, Tuppence is thrilled to learn that Tommy has taken over a defunct detective agency. With business off to a slow start, Tuppence concocts a PR gambit and soon the pair is on to a real case involving the theft of a valuable pearl. The young new mistress of Thurley Grange fears someone in the house is trying to kill her. Tommy and Tuppence are hired to investigate, though death does indeed visit the grim old house. 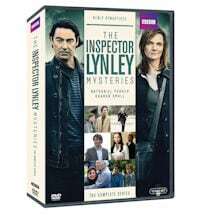 The detectives are left to find the culprit from an array of unlikely suspects. When a partner in an insurance firm is found murdered on a golf course, evidence at the scene points to a female suspect taken into custody. Tuppence discovers a crucial flaw in the case against the woman that the men have overlooked. The death of her wealthy aunt seems to be the salvation of a young woman whose clergyman father has passed away and left her destitute. The young woman turns to Blunt's Detective Agency for help to recover the aunt's vanished fortune and rout the poltergeists of the large, apparently haunted, country house. Tommy and Tuppence are intrigued by a coded message in a newspaper's personal column. Their intuition about a suggested rendezvous in the message is proven accurate, but a new mystery surfaces when a tryst turns deadly. Tommy and Tuppence investigate a strange case involving luggage belonging to the U.S. ambassador to Britain. The danger escalates after a mysterious suicide and a violent altercation in the offices of Blunt's Detective Agency. A beautiful woman's past, a local ghost, and a heavy mist unsettle the village of Adlington. Tommy and Tuppence, having failed to unravel a robbery case there, find a new mystery that needs their attention. A wealthy young man asks Tommy and Tuppence to help him with the woman he loves. She will marry him only if he can prove that one of the two alibis she concocts is false, a challenge that nearly confounds the detectives. A famous Arctic explorer asks for help finding his fiancee, who has seemingly vanished. With only one clue to follow, Tommy and Tuppence discover mysterious happenings at a gloomy house called the Grange. Tommy and Tuppence take on an undercover assignment from Inspector Marriott as part of an effort to catch a gang of forgers. Their job-to mingle with high-rollers-delights Tuppence, who sees it as an opportunity to buy a new wardrobe. Other: Due to the age of these programs and the improved resolution that DVD provides, you may notice occasional flaws in the image and audio on this DVD presentation that were beyond the studio's ability to correct from the original materials.